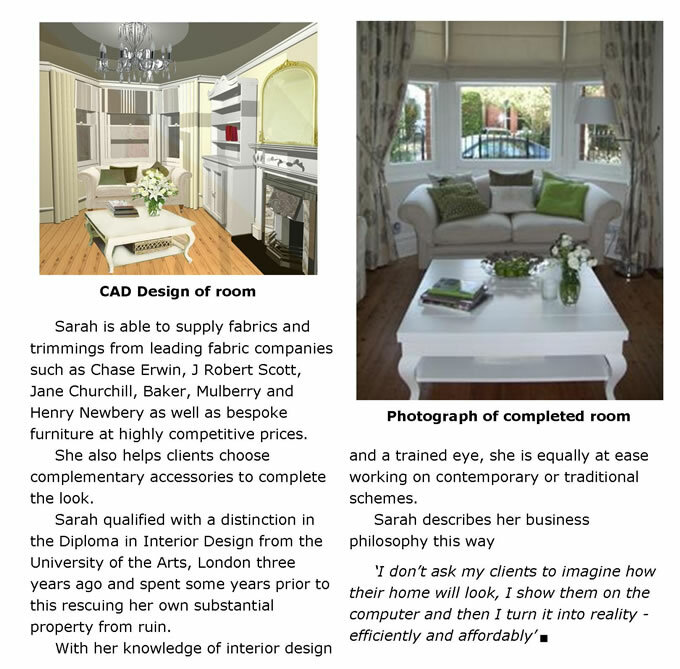 Read the article 'Designer Style', as featured in the Nov 2009 edition of Surrey Life Magazine. The article is reproduced below. 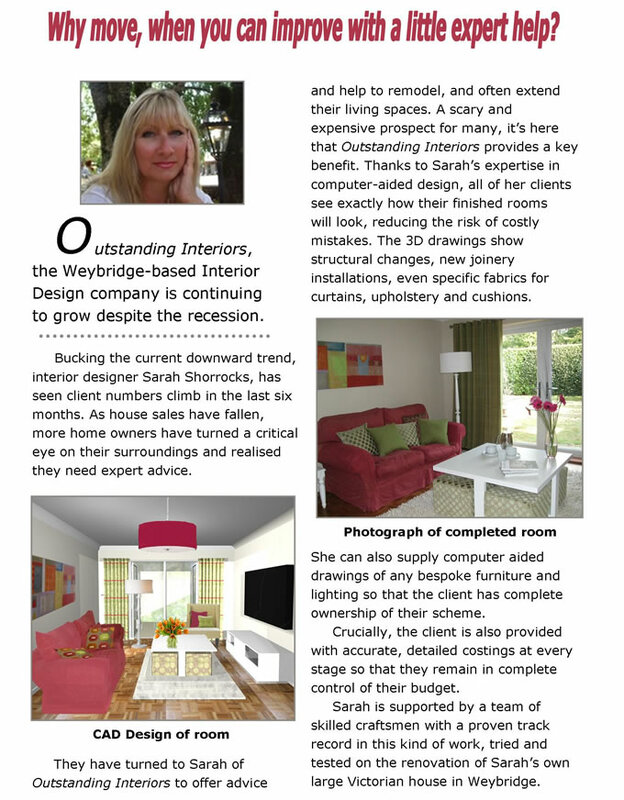 To see the Weybridge flyer article, please click here. To read the multiple page article 'Against The Odds' about our Victorian detached home featured in the January 2011 edition of 25 Beautiful Homes, please click here. To read the article 'No Place Like Home' featured in the August 2012 edition of 25 Beautiful Homes, please click here. To read the article 'Elegance & Style' featured in the May 2013 edition of 25 Beautiful Homes, please click here. She then creates a precise flatplan of the room on the computer, which is extruded into a 3D image complete with furniture and colour to give it authenticity. Crucially, the client is then provided with detailed costings, so there are no surprises. However, she firmly believes that good design should transcend budgets. “Even with a relatively small budget, it’s possible to get the wow factor into a scheme,” she says. Chase Erwin who produce luxurious weaves, cashmeres and silks – all very glamorous and expensive. Despite the economic climate, Sarah says glamour is high on everyone’s agenda and she is now being asked for elaborate curtain treatments with interesting details and rich velvet or paisley fabrics in gold or metallic. THE last thing you would normally associate with the glamorous world of interiors is a designer who has a complete fascination with computers. But for 48 year-old Sarah Shorrocks, producing computer generated images is an essential part of instilling confidence in her clients and encouraging them to be totally involved in the design process. Her love of design began when she was just a young child – she held a paintbrush even before picking up a pen – and she maintained her creativity during her previous career in education. But it wasn’t until she and her husband bought a crumbling house in Weybridge that her imagination really took flight. “When we bought the house 16 years ago, it had four walls and a shaky roof, but it was worth rescuing!” she says. the University of the Arts in London. enough – Sarah also wanted to know how to work with space, so took a course in creating computer generated images, which gave her the tools to use the dynamics of space effectively. skills are offered at fundraising events. When she meets a client for the first time, Sarah begins with a style diagnosis to identify their taste. Next, she will present her library of computer colour schemes.